Here’s something you don’t see everyday, Safari in an epic freakout and taxing 7,909.9% CPU usage. WTF? I have had this occur while browsing/loading flash-intensive sites. I had to close Safari, go there with FireFox. that shows 700% but do you have a 70 core machine? Yup. Anything Flash related. My fans some on FULL BLAST. CPU is through then roof. And sometimes Safari literally its, and I send the automatic report to Apple. I HATE FLASH. Always have. And any site I encounter with it? I just close the window. visit the following site with FF or Safari and the CPU use rises to near max. Dale, that site is in java…new bad news. Dale, I just popped over to that site you mentioned. My CPU usage was about 35%. No big deal at all. Check out ClickToFlash. It blocks Flash and allows you to load it when wanted it with a simple click. It’s rejuvenated my Safari and keeps the beachballs at bay and the fans spun down. A must-have plugin for Safari. 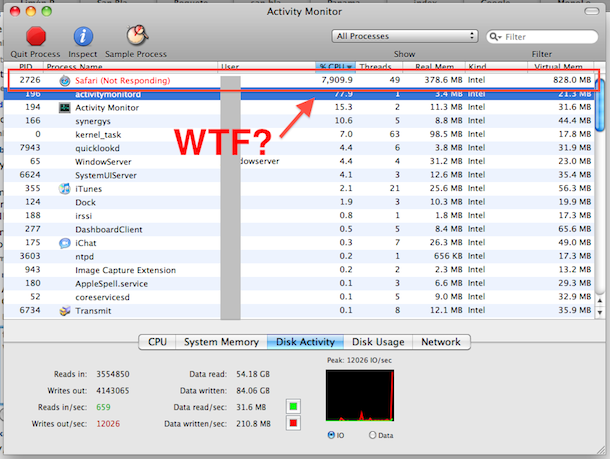 The truth is, Safari could not really use up that much CPU as there is not really that much! It is just that Safari needs that much to dodge the Not Responding Section. Just quit Safari, and it would be normal. I have several macs and it work for me.